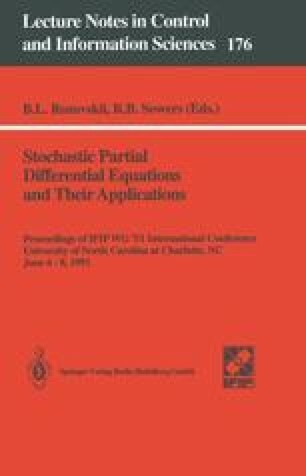 For the author the theory of stochastic partial differential equations started in the fall of 1974 when A.K. Zvonkin and I were preparing, for a conference in Druskininkai, a review  on the theory of strong and weak solutions of Ito's stochastic equations. I was necessarily thinking about different representations of solutions. It appeared that one of them can be based on the fact that the solution of Ito's stochastic equation can be viewed as a solution of a SPDE. Actually, at that time the theory of such equations was not developed and in  (see also ) only a straightforward consequence of such point of view was presented. Now the theory of SPDE's does exist, it is well developed and is well connected with calculations of certain conditional expectations, which give representations of solutions of these SPDE's (see, e. g. ,  and references there). These representations are proved rigorously, but, as it is often the case, the proofs scarcely explain genuine reasons why the representations are true and how in fact they were found. Exactly the latter I want to discuss here in a mere informal way, formal proofs being known for all our formulas but the two last ones (4.13), (4.18), general case of which is relatively new and very cumbersome. The author hopes that this article will serve as a (good) introduction to the theory of SPDE's.